I’m Peter Billingham. I’m professor of Drama and Performance at the University of Winchester. I have written plays which received professional production. I’ve lived a full and creative life in an important area for all humans. Bishop Bell thought that too. I quote from one of Shakespeare’s villains – I hope Chichester Observer might use it. “Good name in man and woman dear my Lord is my immediate jewel of my soul. But he that filches from me my good name. Robs me of that which not enriches him. My short talk is about his commitment to drama and professional theatre. The two were inseparable. I will refer to his founding of RADIUS – the religious drama society of Great Britain. RADIUS promotes drama to this day. Most RADIUS members such as TS Eliot believed all creative work is an extension of divine creativity. Bishop Bell and TS Eliot feel the world needs good drama that makes us think and challenges us. Not drama as a form of propaganda, even if it is something you believe in. They were motivated by drama that can talk to the widest audience. RADIUS continues today on diminished resourcing. It was established during the war at St Paul’s Church, Covent Garden. Dame Judy Dench is one of the organisation’s patrons and started her acting career in 1951. The mystery plays have been performed on an annual basis ever since. I will introduce a timeline to share my thoughts on Bishop Bell. It was in 1930 that Bishop Bell initiated the founding of RADIUS. He appointed Elliott Martin Brown. Brown had read theology. He was married to an actress. With his wife, he was active in a very good community theatre festival in Angmering. He and TS Eliot made regular visits to that festival. It brought together actors and normal citizens. In 1935 TS Eliot accepted a commission from Bishop Bell to direct a play. It would be presented at Canterbury Cathedral. It was directed by Elliott Martin Brown. He directed the premieres of all of his work. The background of the commissioning of “Murder in the Cathedral” was this. Bishop Bell asked Martin Brown, along with TS Eliot if they would produce a poetic drama called “The Rock” which was performed at Sadlers Wells. It had a non-professional cast. It also had famous actors in the key roles. This project made a large amount of money for the time – £800. The money went into promoting drama and the work of RADIUS. Brown succeeded Bishop Bell and in March 1939 put on Family Union. With his company, the Pilgrim Players, he took drama to areas which had not seen performances before. There were some fine actors who had good careers. TS Eliot was the standby of that company. They also produced the work of James Bridie – a Scottish dramatist. In the post war period, Martin Brown premiered Eliot’s “A Cocktail Party” in 1948. Actor/director Wilfred Harrison wrote a play [title unclear on transcript] that takes as its premise the decline of Christianity in the 20th century – becoming Carpet Warehouses etc. The sense of a faith and tradition in critical decline. That decline has not halted. Harrison wrote this play for performance in a church. He took the premise that the church isn’t paying its way. Should it be wound up? The church drama group comes to the meeting to say they have been exploring the relationship between Bonhoeffer’s world. They decided to have a play where we meet characters from the past. It contains a short speech from the play from Bonhoeffer that paraphrases Bonhoeffer’s writing. We are coming towards the end of the play. There has been a debate of the sort that would have excited and pleased Bishop Bell. There is a character called Marsh. He was the founder of the theatre group. He adopted the role of Bonhoeffer of the play within the play. They would be pleasing to Bishop Bell. 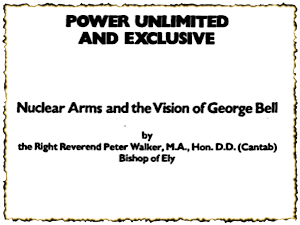 That play was commissioned within a context of a historical trend in the 20th Century that Bishop Bell initiated. We can only hope his name will be returned to his proper and much respected place. I was saddened after the beginning of today’s event. I had hoped the Bishop would be prepared to say something concrete and positive. Like many of you thought, that was not the case. Long may drama and theatre continue and so may we until there is a time to celebrate. 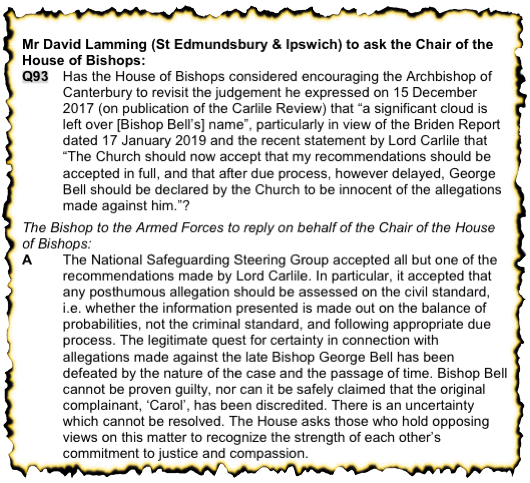 Click the picture to download the General Synod Questions for February 2019. Sandra Saer: I will now ask Christopher Hoare to speak. Christopher Hoare: I feel hesitant about addressing you, as you were expecting someone from the top of the tree, not a twig. Some of you know more about this topic than I do. David Hopkinson could not be with us today. David served in the Navy and then became a clerk in the House of Commons: in 1962 he joined M&G until 1987. He was chair of Harrison and Crossfield, Wolverhampton Brewery, was on the Bank of England advisory committee, he advised on pension funds. He was always publicly minded and cultured. He advised the English Chamber Orchestra, he was governor of well-regarded public schools. He was a church commissioner in 1973. He was on our cathedral development trust, Brighton Pavilion etc. He is a generous donor for a wide number of causes. He is a fellow of St Anne’s college Oxford, a CBE. Bishop Bell officiated at David’s wedding. There is a picture of the occasion – Richard has put a copy of David’s book in the library. Bishop Bell remained a friend of the Hopkinsons. I was going to talk about his wartime exploits. I think that is irrelevant. It was after Bishop Bell’s [?death?] that David was appointed. Bishop Bell visited almost every week when in the country. Mothers and the superior loved him. The order had funds. I don’t know how many others laid claim to the vision of the house of contemplation. The greatest credit must be his. There were fears about the longevity of the existing sisters. The building was blessed in 2008 when there were only four still living. All have now become angels. May they rest in their graves.